Sonar (originally an acronym for sound navigation ranging) is a technique that uses sound propagation (usually underwater, as in submarine navigation) to navigate, communicate with or detect objects on or under the surface of the water, such as other vessels. Two types of technology share the name "sonar": passive sonar is essentially listening for the sound made by vessels; active sonar is emitting pulses of sounds and listening for echoes. 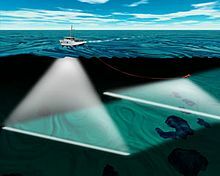 Sonar may be used as a means of acoustic location and of measurement of the echo characteristics of "targets" in the water. Acoustic location in air was used before the introduction of radar. Sonar may also be used in air for robot navigation, and SODAR (an upward-looking in-air sonar) is used for atmospheric investigations. The term sonar is also used for the equipment used to generate and receive the sound. The acoustic frequencies used in sonar systems vary from very low (infrasonic) to extremely high (ultrasonic). The study of underwater sound is known as underwater acoustics or hydroacoustics. The first recorded use of the technique was by Leonardo da Vinci in 1490 who used a tube inserted into the water to detect vessels by ear. It was developed during World War I to counter the growing threat of submarine warfare, with an operational passive sonar system in use by 1918. Modern active sonar systems use an acoustic transponder to generate a sound wave which is reflected back from target objects. Although some animals (dolphins, bats, some shrews, and others) have used sound for communication and object detection for millions of years, use by humans in the water is initially recorded by Leonardo da Vinci in 1490: a tube inserted into the water was said to be used to detect vessels by placing an ear to the tube. In the late 19th century an underwater bell was used as an ancillary to lighthouses or light ships to provide warning of hazards. The Canadian engineer Reginald Fessenden, while working for the Submarine Signal Company in Boston, built an experimental system beginning in 1912, a system later tested in Boston Harbor, and finally in 1914 from the U.S. Revenue (now Coast Guard) Cutter Miami on the Grand Banks off Newfoundland. In that test, Fessenden demonstrated depth sounding, underwater communications (Morse code) and echo ranging (detecting an iceberg at 2 miles (3 km) range). The "Fessenden oscillator", operated at about 500 Hz frequency, was unable to determine the bearing of the iceberg due to the 3-metre wavelength and the small dimension of the transducer's radiating face (less than 1/3 wavelength in diameter). The ten Montreal-built British H-class submarines launched in 1915 were equipped with Fessenden oscillators. By 1918, Britain and France had built prototype active systems. The British tested their ASDIC on HMS Antrim in 1920 and started production in 1922. The 6th Destroyer Flotilla had ASDIC-equipped vessels in 1923. An anti-submarine school HMS Osprey and a training flotilla of four vessels were established on Portland in 1924. The U.S. Sonar QB set arrived in 1931. By the outbreak of World War II, the Royal Navy had five sets for different surface ship classes, and others for submarines, incorporated into a complete anti-submarine attack system. The effectiveness of early ASDIC was hampered by the use of the depth charge as an anti-submarine weapon. This required an attacking vessel to pass over a submerged contact before dropping charges over the stern, resulting in a loss of ASDIC contact in the moments leading up to attack. The hunter was effectively firing blind, during which time a submarine commander could take evasive action. This situation was remedied by using several ships cooperating and by the adoption of "ahead-throwing weapons", such as Hedgehogs and later Squids, which projected warheads at a target ahead of the attacker and thus still in ASDIC contact. Developments during the war resulted in British ASDIC sets that used several different shapes of beam, continuously covering blind spots. Later, acoustic torpedoes were used. Early in World War II (September 1940), British ASDIC technology was transferred for free to the United States. Research on ASDIC and underwater sound was expanded in the UK and in the US. Many new types of military sound detection were developed. These included sonobuoys, first developed by the British in 1944 under the codename High Tea, dipping/dunking sonar and mine-detection sonar. This work formed the basis for post-war developments related to countering the nuclear submarine. During the 1930s American engineers developed their own underwater sound-detection technology, and important discoveries were made, such as thermoclines, that would help future development. After technical information was exchanged between the two countries[clarification needed] during the Second World War, Americans began to use the term SONAR for their systems, coined as the equivalent of RADAR. In 1917, the US Navy acquired J. Warren Horton's services for the first time. On leave from Bell Labs, he served the government as a technical expert, first at the experimental station at Nahant, Massachusetts, and later at US Naval Headquarters, in London, England. At Nahant he applied the newly developed vacuum tube, then associated with the formative stages of the field of applied science now known as electronics, to the detection of underwater signals. As a result, the carbon button microphone, which had been used in earlier detection equipment, was replaced by the precursor of the modern hydrophone. Also during this period, he experimented with methods for towing detection. This was due to the increased sensitivity of his device. The principles are still used in modern towed sonar systems. To meet the defense needs of Great Britain, he was sent to England to install in the Irish Sea bottom-mounted hydrophones connected to a shore listening post by submarine cable. While this equipment was being loaded on the cable-laying vessel, World War I ended and Horton returned home. Magnetostrictive transducers were pursued after World War II as an alternative to piezoelectric ones. Nickel scroll-wound ring transducers were used for high-power low-frequency operations, with size up to 13 feet (4.0 m) in diameter, probably the largest individual sonar transducers ever. The advantage of metals is their high tensile strength and low input electrical impedance, but they have electrical losses and lower coupling coefficient than PZT, whose tensile strength can be increased by prestressing. Other materials were also tried; nonmetallic ferrites were promising for their low electrical conductivity resulting in low eddy current losses, Metglas offered high coupling coefficient, but they were inferior to PZT overall. In the 1970s, compounds of rare earths and iron were discovered with superior magnetomechanic properties, namely the Terfenol-D alloy. This made possible new designs, e.g. a hybrid magnetostrictive-piezoelectric transducer. The most recent such[clarification needed] material is Galfenol. Active sonar creates a pulse of sound, often called a "ping", and then listens for reflections (echo) of the pulse. This pulse of sound is generally created electronically using a sonar projector consisting of a signal generator, power amplifier and electro-acoustic transducer/array. A beamformer is usually employed to concentrate the acoustic power into a beam, which may be swept to cover the required search angles. Generally, the electro-acoustic transducers are of the Tonpilz type and their design may be optimised to achieve maximum efficiency over the widest bandwidth, in order to optimise performance of the overall system. Occasionally, the acoustic pulse may be created by other means, e.g. chemically using explosives, airguns or plasma sound sources. In combat situations, an active pulse can be detected by an enemy and will reveal a submarine's position. A sonar target is small relative to the sphere, centred around the emitter, on which it is located. Therefore, the power of the reflected signal is very low, several orders of magnitude less than the original signal. Even if the reflected signal was of the same power, the following example (using hypothetical values) shows the problem: Suppose a sonar system is capable of emitting a 10,000 W/m2 signal at 1 m, and detecting a 0.001 W/m2 signal. At 100 m the signal will be 1 W/m2 (due to the inverse-square law). If the entire signal is reflected from a 10 m2 target, it will be at 0.001 W/m2 when it reaches the emitter, i.e. just detectable. However, the original signal will remain above 0.001 W/m2 until 3000 m. Any 10 m2 target between 100 and 3000 m using a similar or better system would be able to detect the pulse, but would not be detected by the emitter. The detectors must be very sensitive to pick up the echoes. Since the original signal is much more powerful, it can be detected many times further than twice the range of the sonar (as in the example). 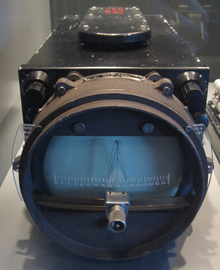 The LIMIS (limpet mine imaging sonar) is a hand-held or ROV-mounted imaging sonar for use by a diver. Its name is because it was designed for patrol divers (combat frogmen or clearance divers) to look for limpet mines in low visibility water. The LUIS (lensing underwater imaging system) is another imaging sonar for use by a diver. 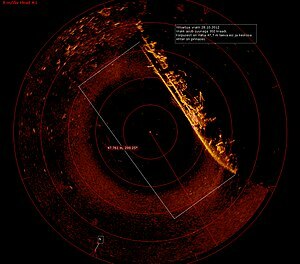 Passive sonar has a wide variety of techniques for identifying the source of a detected sound. For example, U.S. vessels usually operate 60 Hz alternating current power systems. If transformers or generators are mounted without proper vibration insulation from the hull or become flooded, the 60 Hz sound from the windings can be emitted from the submarine or ship. This can help to identify its nationality, as all European submarines and nearly every other nation's submarine have 50 Hz power systems. Intermittent sound sources (such as a wrench being dropped), called "transients," may also be detectable to passive sonar. Until fairly recently,[when?] an experienced, trained operator identified signals, but now computers may do this. An example of a modern active-passive ship towed sonar is Sonar 2087 made by Thales Underwater Systems. Torpedo countermeasures can be towed or free. An early example was the German Sieglinde device while the Bold was a chemical device. A widely used US device was the towed AN/SLQ-25 Nixie while the mobile submarine simulator (MOSS) was a free device. A modern alternative to the Nixie system is the UK Royal Navy S2170 Surface Ship Torpedo Defence system. Mines may be fitted with a sonar to detect, localize and recognize the required target. An example is the CAPTOR mine. Mine countermeasure (MCM) sonar, sometimes called "mine and obstacle avoidance sonar (MOAS)", is a specialized type of sonar used for detecting small objects. Most MCM sonars are hull mounted but a few types are VDS design. An example of a hull mounted MCM sonar is the Type 2193 while the SQQ-32 mine-hunting sonar and Type 2093 systems are VDS designs. Helicopters can be used for antisubmarine warfare by deploying fields of active-passive sonobuoys or can operate dipping sonar, such as the AQS-13. Fixed wing aircraft can also deploy sonobuoys and have greater endurance and capacity to deploy them. Processing from the sonobuoys or dipping sonar can be on the aircraft or on ship. Dipping sonar has the advantage of being deployable to depths appropriate to daily conditions. Helicopters have also been used for mine countermeasure missions using towed sonars such as the AQS-20A. Dedicated sonars can be fitted to ships and submarines for underwater communication. The net sounder is an echo sounder with a transducer mounted on the headline of the net rather than on the bottom of the vessel. Nevertheless, to accommodate the distance from the transducer to the display unit, which is much greater than in a normal echo-sounder, several refinements have to be made. Two main types are available. The first is the cable type in which the signals are sent along a cable. In this case there has to be the provision of a cable drum on which to haul, shoot and stow the cable during the different phases of the operation. The second type is the cable-less net-sounder – such as Marport's Trawl Explorer - in which the signals are sent acoustically between the net and hull mounted receiver-hydrophone on the vessel. In this case no cable drum is required but sophisticated electronics are needed at the transducer and receiver. Small sonars have been fitted to remotely operated vehicles (ROVs) and unmanned underwater vehicles (UUVs) to allow their operation in murky conditions. These sonars are used for looking ahead of the vehicle. The Long-Term Mine Reconnaissance System is a UUV for MCM purposes. Detection of fish, and other marine and aquatic life, and estimation their individual sizes or total biomass using active sonar techniques. As the sound pulse travels through water it encounters objects that are of different density or acoustic characteristics than the surrounding medium, such as fish, that reflect sound back toward the sound source. These echoes provide information on fish size, location, abundance and behavior. Data is usually processed and analysed using a variety of software such as Echoview. Sonars have been developed that can be used to characterise the sea bottom into, for example, mud, sand, and gravel. Relatively simple sonars such as echo sounders can be promoted to seafloor classification systems via add-on modules, converting echo parameters into sediment type. Different algorithms exist, but they are all based on changes in the energy or shape of the reflected sounder pings. Advanced substrate classification analysis can be achieved using calibrated (scientific) echosounders and parametric or fuzzy-logic analysis of the acoustic data. The sonar's resolution is angular; objects further apart are imaged with lower resolutions than nearby ones. ^ Halvorsen et al. (2013) conclude that observed effects were "typically small even though the fish were near the sonar and remained there for the full duration of three test signals". ^ Jürgen Rohwer; Mikhail Monakov; Mikhail S. Monakov (2001). Stalin's Ocean-going Fleet: Soviet Naval Strategy and Shipbuilding Programmes, 1935-1953. Psychology Press. p. 264. ^ a b c "Sonar". Encyclopaedia Britannica. Retrieved 18 January 2019. ^ a b Fahy, Frank (1998). Fundamentals of noise and vibration. John Gerard Walker. Taylor & Francis. p. 375. ISBN 978-0-419-24180-5. ^ a b Hill, M. N. (1962). Physical Oceanography. Allan R. Robinson. Harvard University Press. p. 498. ^ Seitz, Frederick (1999). The cosmic inventor: Reginald Aubrey Fessenden (1866–1932). 89. American Philosophical Society. pp. 41–46. ISBN 978-0-87169-896-4. ^ Hendrick, Burton J. (August 1914). "Wireless under the water: a remarkable device that enables a ship's captain to determine the exact location of another ship even en the densest fog". The World's Work: A History of Our Time. XLIV (2): 431–434. Retrieved 2009-08-04. ^ "Report of Captain J. H. Quinan of the U.S.R.C. Miami on the echo fringe method of detecting icebergs and taking continuous soundings". Hydrographic Office Bulletin. 1914-05-13. (quoted in a NOAA transcript by Central Library staff April, 2002 Archived 2010-05-10 at the Wayback Machine. ^ "The rotary bowcap". Archived from the original on 2007-06-26. ^ "World War II Naval Dictionary". USS Abbot (DD-629). Archived from the original on February 20, 2014. Retrieved February 19, 2014. ^ W. Hackmann, Seek & Strike: Sonar, anti-submarine warfare and the Royal Navy 1914–54 (HMSO, London, 1984). ^ Howeth: Chapter XXXIX. 1963. ^ Horton, J. Warren (1957). Fundamentals of Sonar. U. S. Naval Institute, Annapolis, MD. p. 387. ^ Sherman, Charles H; Butler, John L; Brown, David A (2008). Transducers and Arrays for Underwater Sound. Acoustical Society of America Journal. 124. p. 1385. Bibcode:2008ASAJ..124.1385S. doi:10.1121/1.2956476. ISBN 9780387331393. Archived from the original on 2018-04-26. ^ Lent, K (2002). "Very High Resolution Imaging Diver Held Sonar". Report to the Office of Naval Research. Archived from the original on 2008-08-13. Retrieved 2008-08-11. ^ Krueger, Kenneth L. (2003-05-05). "Diver Charting and Graphical Display". Texas Univ at Austin Applied Research Labs. Archived from the original on 2009-01-21. Retrieved 2009-01-21. ^ "Fathometer". Archived from the original on 2013-10-20. ^ "NOAA Ocean Explorer: Echo Sounding Reading". Archived from the original on 2015-09-10. ^ "This Suit Gives You A Real Life Spider-Sense". Forbes. 23 February 2013. Archived from the original on 27 February 2013. Retrieved 12 March 2013. ^ Westervelt, P. J. (1963). Parametric acoustic array. The Journal of the Acoustical Society of America, 35(4), 535-537. ^ a b Damian Carrington (3 July 2013). "Whales flee from military sonar leading to mass strandings, research shows". The Guardian. Archived from the original on 1 October 2017. ^ Stacy L. DeRuiter; Brandon L. Southall; John Calambokidis; Walter M. X. Zimmer; Dinara Sadykova; Erin A. Falcone; Ari S. Friedlaender; John E. Joseph; David Moretti; Gregory S. Schorr; Len Thomas; Peter L. Tyack (2013). "First direct measurements of behavioural responses by Cuvier's beaked whales to mid-frequency active sonar". Biology Letters. 9 (4): 20130223. doi:10.1098/rsbl.2013.0223. PMC 3730631. PMID 23825085. Archived from the original on 2015-10-19. ^ a b c Friedman, Norman (1997). The Naval Institute Guide to World Naval Weapons Systems, 1997-1998. ISBN 9781557502681. Archived from the original on 2018-04-26. ^ Søreide, Fredrik (2011-04-28). Ships from the Depths. ISBN 9781603442183. Archived from the original on 2018-04-26. ^ "JW Fishers - High Frequency Side Scan Sonar". Archived from the original on 2015-04-25.